A former town council housing convenor has claimed it is a ‘disgrace’ ‘perfectly good flats’ are being demolished. Newsagent George McMillan, a former coal miner, now in his late 80s, was Campbeltown Town Council housing convenor from 1965 to 1970. Mr McMillan spoke out as Argyll Community Housing Association (ACHA) flats were demolished this week. Mr McMillan said: ‘In 1965, there were 700 people living in unfit housing. Mr McMillan added that Margaret Thatcher’s ‘right to buy’, which ended in Scotland for council and housing association tenants on August 1 2016, ruined the boom of council house building. Right to buy had originally been a Labour proposal and was written into its 1959 general election manifesto. It became Conservative policy in 1974 and was enshrined in law by the 1980 Housing Act. 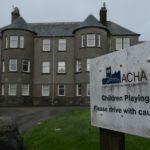 Argyll and Bute Council transferred its housing stock to ACHA in 2006 and any amendments to the ‘original transfer agreement must be agreed by ACHA, Argyll and Bute Council and the Scottish Government’. On December 14 2017 ACHA made stock restructure proposals to the council’s planning, housing and regulatory community services committee. In Saddell Street, Prince’s Street and Queen Street, ACHA proposed to demolish a total of 27 flats. The committee agreed to recommend that the council: Agreed ACHA’s proposals to remove 89 units from its affordable rented stock, including the Saddell, Prince’s and Queen Street properties, by means of sale or demolition by a formal amendment to the transfer agreement; support ACHA’s request to the Scottish government to exclude any disposals undertaken as part of these proposals from the tripartite disposal clawback agreement and advise ACHA that the proposed demolitions will require to be the subject of separate approvals from the council as the planning and building control authority. ACHA was also to be reminded it will remain responsible for the maintenance of the areas of land detailed in this report and advise ACHA that any future proposals to dispose of any of the land freed up by the demolitions will be subject to approval from Argyll and Bute Council. The demolition work in Saddell, Prince’s and Queen Street is being undertaken by McFadyens Contractors. A McFadyens spokesperson said: ‘McFadyens Contractors has been engaged by ACHA to demolish the properties on Queen Street, Prince’s Street and Saddell Street. ‘This process required careful consultation with the client, specialist sub-contractors and utility providers to ensure the buildings were made safe in advance of demolition. 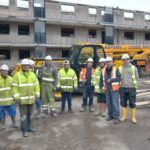 ‘Work included the disconnection and diversion of overhead and buried services, asbestos removal by specialist contractors and controlled inspection and co-ordination with ecology experts to carefully remove bats found in some properties. ‘McFadyens Contractors has used its in-house construction plant to carry out the work.